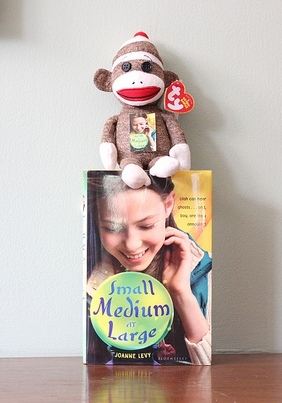 The SMALL MEDIUM AT LARGE Big Giveaway Finale! Hi again. *Whew* It’s been a busy couple of weeks, and we’re not done yet! But I thought I’d kick off the BIG GIVEAWAY FINALE. So here’s how it’s going to work. I need you to keep working on your Street Team activities (thank you for your efforts so far!). But I’m also going to add in a huge prize pack of awesomeness as a thank you to anyone who has bought my book. That’s right: 8 books for that special young person in your life. But wait – there’s more! I’m also going to throw in a SMALL MEDIUM AT LARGE Street Team t-shirt. Swaggy bracelets, bookmarks (not just mine) and Lewis, the sock monkey. All you have to do is send me an e-mail at contact@joannelevy.com with a scan of your receipt for buying SMALL MEDIUM AT LARGE attached and tell me who you bought it for-yourself, your friend, niece, whoever – there is no wrong answer! AND in addition to the prize pack above, I will also send you a signed copy of SMALL MEDIUM AT LARGE, inscribed just the way you like, so that you can have a special one to keep for yourself or pass along. So that’s 9 books, swag and my eternal thanks for buying my book. You’ve got until the end of the month: July 31 at 11:59 to send me your entry. Previous PostJuly Street Team Check In.Next PostAugust Street Team Check In. Hi Lilah – how great that you found a book with a character with the same name as yours! Thanks for stopping by and happy belated birthday!